Classified as | "tons of trichomes"
Looks: Deep purple, there are almost no spots of the bud that are not covered in trichomes. Deep amber hairs and a few purple green leaves. 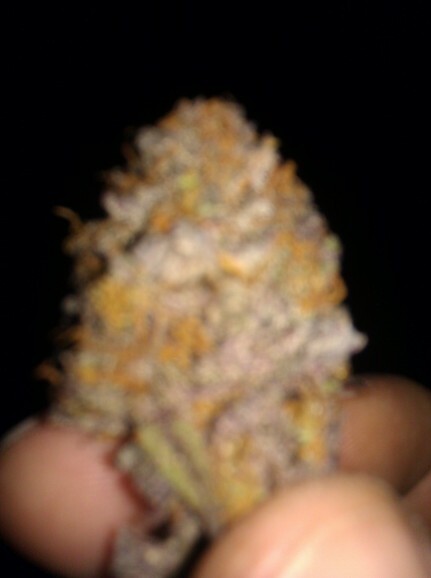 Smell: Extremely dank smelling, strong hints of sweet and sour, incredibly fresh. Taste: Very smooth tasting, doesn’t build up much either. Once you’re done smoking the taste pretty much goes away. Effects: The high was very quick to come up to full force. The group that I smoke with has relatively high tolerances, as do I. I can say that after all of our first hits of the bong, we were thoroughly ripped. After finishing up several sesh’s, we all felt great and very relaxed. The strong indica presence was clean and pure, having all the qualities of a great medical strain. Potency: A relativity strong very unique high. Good Strain For: Anytime you need to relax or ease pain. This strain is an Indica dominant hybrid. It is a phenotype (which refers to a trait that is visible to the naked eye, i.e. color, shape, size, etc.) of the famous Grandaddy Purple out of Northern California. This particular phenotype is supposedly a cross of Afghani with Skunk #1 that was created by Apothecary Genetics. It won 1st Place in the 2005 and 2006 Green Cup and 1st Place in the 2006 Medical Cup in Lake County in 2006. When flowering INDOOR, this plant takes about 7-8 weeks and yields around 700-800 grams/sq m² (that’s grams per meter squared, or square meter). When flowering OUTDOOR, this plant us ready at the end September to mid-October. You can find more “official” info at http://www.apothecarygenetics.com/ in the strains section on the menu bar! In MY experience, this plant grows more bushy than tall and produces heavy, dense buds. It is a heavy producer. This is a hearty strain that is very resistant to pests, mold/fungus, and even PH issues. This particular bud (pictured) was grown in a soil/coco mix in a 10 gallon pot using Advance Nutrients Sensi system. 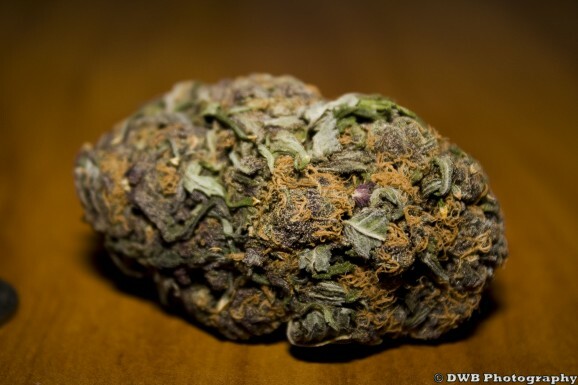 Beautiful dark green bud covered with many burnt orange colored hairs. Leaves covered in frosty trichromes. Very nice strain to look at! Rich, sweet sugary smell with an oh so slight grape touch that you’d think a tiny grape angel gave it a kiss!! I love the smell of this one because it is no overbearing. It doesn’t assault my nose. Thick sweet smoke with a rich and elegant soft grape favor with no cough (if flushed and dried properly, of course). This strain is one of the best tasting ones I have had. I medicated with 0.05 grams and I used my 12 in DBP water pipe and a refillable lighter with 5x refined butane. It was great to be able to taste just the medicine and not butane. This uplifting strain is great for going along with your breakfast to wake you up and inspire you to do something. This is the type of strain to rid you of any pain, especially migraines, and bring you out of and sour mood. Great before work strain when you need to have a clear head, but need just enough to make it to work without killing anyone. Great replacement for coffee!!! I have a hard time getting upset when medicated with this strain. This strain is also a good strain to help people focus. I would say it would work wonders for ADD and ADHD students trying to listen to a lecture or study. 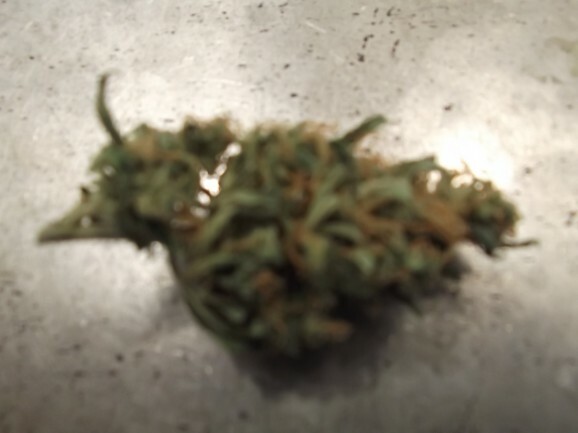 When using 0.05 grams – 60 mins medicinal-level potency; about 90 mins overall. This may not seem long, but 0.05 grams is a pretty small amount!! When writing a review I use this amount so that I will never be too medicated to write! Relief of pain (especially: migraines and headaches and muscle ache), stress, depression, fatigue, anxiety, anger. This strain is a great calming agent and relaxant. Great for coming home from a hard day at work and relaxing with your family and eating dinner! This strain is absolutely one of my favorite. It is definitely in my top 5 Best Strains Ever! I was very pleased with all of the positive effects and the dry eyes didn’t last but about 10 minutes. I really like this strain for everyday use, day OR night. It is hard to find a great hybrid like this. I will definitely be keeping it in my garden! Thanks for reading! I hope you enjoyed! And I hope you get to try some Grape Ape soon! **NOTE** Outspoken Toker is an authorized medical marijuana patient in their home state that is expressing their personal preferences and opinions about named strains. Outspoken Toker is NOT a medical professional and is NOT offering any medical advice in any way, shape, or form. This and all other articles written on medicalmarijuanastrains.com are for informational purposes only. Everything in this article is strictly the option of Outspoken Toker. All information is based on personal experience and/or knowledge gained from other sources which will be named accordingly. Outspoken Toker will NOT be held responsible for any adverse effects that may come as a result of using this strain.